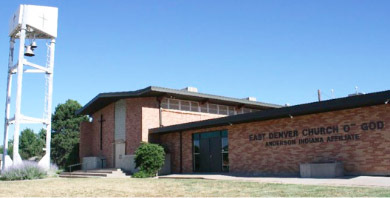 East Denver Church of God was established in 1917, affiliated with the Church of God, of Anderson, IN. We are a multicultural congregation in the Stapleton and Park Hill neighborhood of Northeast Denver. We are located a quarter mile west of Stapleton, on the corner of MLK and Monaco. If you are looking for a place to belong and place to be accepted, this is a place for you. All are welcome in God's house. God is in the business of redeeming people, no matter where you are in life! & Wednesday night for bible study @6pm! "We are small church with a active and loving fellowship"
"Come and help us Build God's kingdom"
Serving the Lord for 20+ years. Graduated 1990 from Mid-America Christian University, Oklahoma. Ordained minister. Born in Taichung, Taiwan to a military family. Bobby met his wife Regina in 1986, married a year later. He is blessed with two wonderful children, Daughter Paige and Son Stewart. Spent 20 years in Urban Youth Ministry. Coached boys varsity basketball in the high school for many years. Enjoys Mission work around the world. Enjoys various sporting activities such as tennis, golf and basketball. He is self employed by Affordable Computer Solutions & Godside Ministries. which allows him to have a flexible schedule for ministry. Enjoys Traveling, Christian music, watching various sporting events and meeting new people just like you!